Anonymous sale, Sotheby's, London, 24 June 1986, lot 41. First explored by Chagall in the early 1920s as a romantic extension to the symbolic vocabulary of the paintings depicting himself with his beloved wife Bella, the vase of flowers became a perennial theme in Chagall's art. 'It was in Toulon in 1924, Chagall recalls, that the charm of French flowers first struck him. He claims he had not known bouquets of flowers in Russia - or at least they were not so common as in France... He said that when he painted a bouquet it was as if he was painting a landscape. It represented France to him. But the discovery was also a logical one in the light of the change taking place in his vision and pictorial interests. Flowers, especially mixed bouquets of tiny blossoms, offer a variety of delicate color combinations and a fund of texture contrasts which were beginning to hold Chagall's attention more and more' (J.J. Sweeney, Marc Chagall, New York, 1946, p. 56). 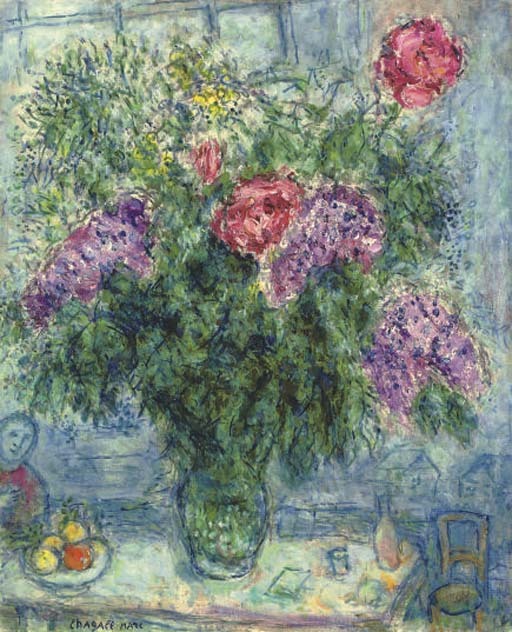 As in the present work, Chagall's bouquets often consist of strongly coloured blooms exploding from a mass of greenery. Colour was an essential element of Chagall's work in its own right and the bouquet allows him to manipulate dramatic contrasts and subtle harmonies with aplomb. Chagall further accentuates this chromatic outburst through the textures of his paint surface, contrasting the wonderfully impasted flowers with the relatively smooth application of the greens around them. This lively texture lends the painting, in the words of Franz Meyer a 'refined, nervous, and elegant vivacity. The life force is transformed into a firework of figural magic and sparkling light' (F. Meyer, Marc Chagall, Life and Work, New York, 1957, p. 366). Chagall's flowers seem to shimmer with light and movement, while the composition is stabilised by the figure at the extreme left and the still-life on the table, all dwarfed by the enormous bouquet that fills the entire composition. Please note that the present lot is being sold with a photo-certificate from the Comité Chagall.